The Itty Bitty Kitty Committee: An Astrid Easterbrook Update! A couple of weeks back we got to see our old friends Norma and Thurston Easterbrook. Today, their sister Astrid is here with an update. First, let's take a peek at baby Astrid. Here she is today looking shiny, happy and healthy - just like her siblings. I saw Norma and Thurston on the website and I had to share how Astrid, now Pippi, is doing. She is the silliest and cutest cat and it's never a dull moment with her. The funny thing is that she is very playful and vocal normally, but runs to hide whenever guests come to the house. Although she tends to be scared of strangers, anyone lucky enough to play with her instantly falls in love with her. We have several friends and family members who are "dog people", but Pippi has managed to squeeze her way into their hearts. She loves to sunbathe, plays fetch (like Norma! ), loves anything crinkly and of course boxes and shopping bags. She loves her big sister Mochi and they often nap together. Thanks for sharing your lovely girl with us today, Thuc and Daniel! It's very nice seeing her again! She looks very dapper in her tuxedo! If I had a female tuxie, I might name her Janelle, after the famously tuxedo-clad Janelle Monae - or maybe Marlena (Dietrich). Oh my, what a beautiful girl! Another IBKC success story! She has grown into a lovely tuxie girl! Oh, Astrid, you are so perfectly dressed in your black velvet wrap and white fichu. ;) Vintage kitty is vintage. :) Lovely girl! Such a lovely grown-up girl.. Love the glamour shot on the yellow stairs! Hehehe - the picture of her on those awesome yellow stairs cracks me up. She's a very slim, healthy kitty but somehow that lounging pose makes her belly look huge! Silly kitty, you have to find your best angles! Good thing you're still cute, funny angles and all! She's got a little pooch on her. She's definitely the best a posing and tends to be wild than elegant. Ooooh, she has grown into such a beautiful tuxie! She was a doll as a kitten, and now she is a glorious cat!! I LOVE the alumni postings. Astrid/Pippi is gorgeous! I particularly love that black and white shot of her. Thanks for the alumna update! Beautiful! And apparently she no longer has naughtly siblings who chew on her whiskers. I'm not sure she's actual grown at all. She still sounds and acts like a baby kitty. Thanks for all the support. We love this community. I love the cartoon of both of you holding their purring selves! It's adorable! Awww, it's hard to believe that the little squishy-faced kitten with the stubborn look became such an elegant beauty. She is adorable at any age, and she looks so sleek that I imagine it's hard not to pet her all the time. What a lovely kitty she has grown up to be! What a beauty! In the second pic where she's so still with the giant round eyes, she looks like the Kit-Kat clock come to life. Whichever name she goes by, your girl is a total sweetheart!! 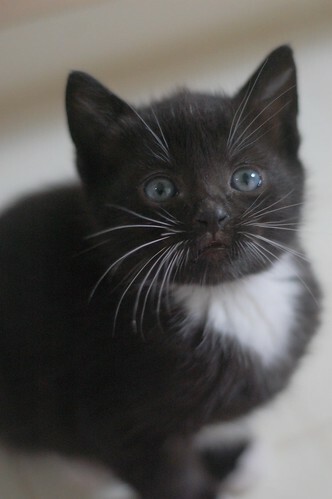 Her baby picture reminds me of our girl Gracie, who was *such* a dolly, and her personality sounds like a combo of Gracie and her tuxie brother Willy. You sure have a dream kitty, and we all appreciate the update.